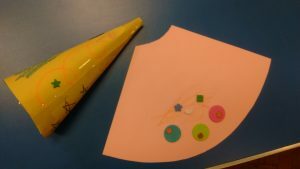 We were looking at songs and music in the Bible, and made simple trumpets from card and decorated them with stickers. To make a trumpet, cut a quarter circle from a piece of card and cut an arc for the mouthpiece at the right-angled corner. It is easier to decorate them while the card is flat. Once they are decorated, use sellotape to form a cone-shaped trumpet.